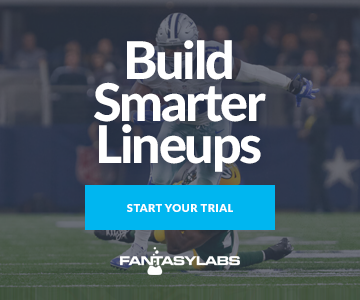 Unlike many weeks of the NFL season, there is not one particular player or situation that stands out as the clear, unadulterated chalk in Week 5. There are some concerns over T.J Yeldon’s volume, even in an elite spot against the Chiefs. Ownership in the high-total Falcons-Steelers game should be spread out with differing opinions and price tags on the ultra-productive players in both offenses. And as such, I am not feeling a real need to try and hone in on one specific 0.1% owned player this week as it appears that all players outside of the Atlanta-Pittsburgh matchup will have suppressed ownership. Mahomes has only rushed for 53 yards and one touchdown this season. He ran for 845 yards in his collegiate career, but that includes losing yards for sacks, and he has an agility score of below 11 — that’s in the 95th-percentile for a quarterback and even more extreme for an running back. Point being: We haven’t seen him unleashed as a rusher, but it’s coming. I understand if you would prefer Cam Newton or Matthew Stafford this week — both are great tournament targets and will make up a good chunk of my ownership — but Mahomes looks like he might truly be the best quarterback in the NFL. Last season, the Jaguars gave up 40 points twice and 37 points to the Titans, so their defense is not impenetrable. Especially on the road. Mahomes is certainly underpriced at only $6,200 on DraftKings and his 2-4% projected ownership makes him a target for me. I am all over this Packers-Lions matchup for fantasy purposes. The pass catchers are clearly better options, but there’s reason to be optimistic about Jones from a DFS perspective. His salary is affordable and gives you a pathway to a unique roster construction as there are not very many good and cheap RB plays this week. Jones ran with style last week against the Bills with a touchdown and nearly six yards per carry. He’s not a real workhorse (or close to it), but there is an avenue to extra playing time this week. If receivers Randall Cobb (hamstring, questionable) and Geronimo Allison (concussion, questionable) can’t play on Sunday, it’s within the realm of possibility that Ty Montgomery plays more like a slot WR. If that does happen, the explosive Jones should get close to 50% of Green Bay’s backfield snaps with upside for more. We’re only two players in and we’ve already reached a guy who is not likely to top 1% owned in large-field tournaments. The Titans haven’t been a good team this season, and Henry has been pretty egregious on a per-play basis. He has less than a 50% share of the Titans’ ground game and has only four targets on the season. He is not a player with a big workload who screams out as a value. However, if you look at the tea leaves in a certain way, Henry becomes viable. The Titans are 3-point road favorites against a Bills team that has thrown multiple interceptions in 3-of-4 games this season. Essentially, this should be one of the few 2018 games that the Titans consider to be a “Henry Game” and not a “Dion Lewis Game.” Henry is still the same guy who tantalized us with upside behind DeMarco Murray, and Henry’s odds of getting 20+ rushes in this game are greater than in any other on Tennessee’s schedule. The Bills are in the bottom 20% of Plus/Minus allowed to running backs, and if you even put Henry on 10% of your guaranteed prize pool teams, you will be overweight to the field. Packers-Lions has elite shootout potential, and neither team’s players are priced that way. A receiver with Tate’s target volume should be closer to $7,500 — not less than $7,000. The Lions and Packers are each in the top 11 in plays ran per game, and both offenses err more toward the air than the ground. This should add some extra plays and pace to the game, even though Detroit often milks the play clock when on offense. Tate has a neutral-at-best cornerback matchup, while Devante Adams is likely to draw Darius Slay. Additionally, Marvin Jones will be the ultra-chalk this week as he’s priced down to $4,700 on DraftKings; we have him projected for 5-8% ownership, but I would take the over on that as he becomes more popular throughout the week. Tate has more total Air Yards than Amari Cooper, JuJu Smith-Schuster, Keenan Allen, Demaryius Thomas, Emmanuel Sanders and Chris Godwin. Tate is seventh in the NFL in total targets, but ownership in this game will be drawn toward Adams, Kenny Golladay (fan favorite), Jones (cheap) and Marquez Valdez-Scantling (also cheap). Tate is a gore GPP play for me this week. It is not immediately clear to me how much ownership Smith-Schuster will have. He’s in the most popular game of the week with the Falcons visiting Heinz Field. Teammates Antonio Brown and James Conner will be popular draws, but we have JSS at 21-25% owned regardless. Given how the public views Brown, I find that hard to believe, but Adam Levitan is very good at projections and he knows more than I do. The reason why I am including someone who is much chalkier than normal in this column is that I want to drive home that I think Smith-Schuster is probably the real WR1 in Pittsburgh for fantasy. Brown and Smith-Schuster are Nos. 2 and 3 in the NFL in targets. Smith-Schuster has 120 more yards, a much higher RACR and is actually out-scoring Brown in PPR points despite only having one touchdown to Brown’s three scores. The only other player to post gaudy totals at this age in the NFL was Randy Moss — both averaged a hair under five catches and more than 75 yards per game before turning 22 — and we rarely see the tides turn before they are already turned. My current strategy is to attack the ATL-PIT game with Smith-Schuster, Julio Jones and Conner. The tight end position is such a barren wasteland that last week’s boring David Njoku performance almost felt like a win. Eric Ebron chalk was of course the play, but now he isn’t in the slate. Uzomah is the main beneficiary of the Tyler Eifert injury and he makes a particularly interesting play this week. He ran more routes this year than did Tyler Kroft despite profiling more like a blocking TE than Kroft. Uzomah is only $2,900 on DraftKings and could take advantage of a Dolphins defense that just cut one of its three best defensive tackles and could be without three of its top four edge players. Uzomah actually ran a 4.67-second 40-yard dash at 263 pounds and was running routes on 31% of the Bengals’ pass plays before Eifert was injured. This is by no means a 100% exposure play, but there is a path to a very low-owned 15-point day for Uzomah.